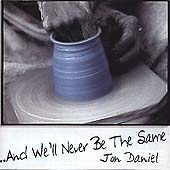 ... And Well Never Be the Same: Vineyard Music EXTRA! Its exciting to see how the young and old are beginning to work together, hand in hand, to take the body of Christ towards the fullness we have been called to. Jon Daniels is a very exciting young artist who has converted the passion that he has for God and His calling into very good songs. The CD itself is altogether great. What Jon has put together is a group of songs each with a wonderful anointing on them, and turned them into a very good CD that is very professionally finished. If youre looking for somthing new, fresh and exciting, this could be the very thing CD you need to get. Listening to it is easy and it is very hard not to be captivated by the words and taken into a session of worship. This is a great listening CD and you seem to like it more the more you listen. To describe it in words: anointed, radical, fun and appealing to all. Have fun listening to what Jon has put together!